Commonwealth Day is marked each year with the unveiling of an annual Commonwealth Theme. 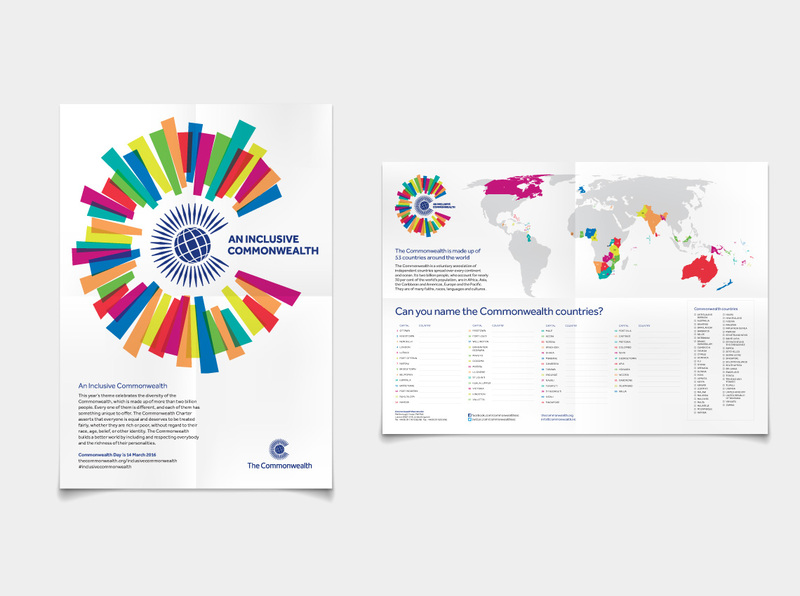 We were tasked with creating a visual identity for the 2016 theme ‘An Inclusive Commonwealth’. The design was required to convey the richness of the Commonwealth as a family in which all member states and their diverse peoples are equal and mutually supported. Our final design for the theme uses a variety of overlaid multicoloured shapes, emanating from a central point. The shapes come together to form a C, which both echoes and envelopes the Commonwealth logo in the centre. The design and colours are used boldly on printed material to appeal to people of all ages throughout the diverse countries of the Commonwealth.